Make bricks, bowling balls, fish bowls even a hot cup of coffee appear from nowhere! Andrew Mayne presents his innovative technique for making impossible and unwieldy objects appear from impossible places. 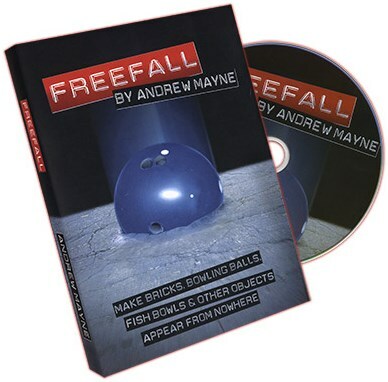 Bowling Ball - An updated handling on Andrew's Bowling Ball from Shopping Bag effect that makes a great show opener or closer. Includes Andrew's new handling and technique that makes this a portable, practical illusion you'll want to make a part of your show. Brick - Make a heavy brick appear from an empty lunch bag and drop it literally at your audience's feet. This never-seen-before effect allows you to create a huge impact up close or onstage when you produce a real brick under the most challenging conditions. Fish Bowl - Make a fish bowl appear complete with real fish! Use it as part of an Aerial Fishing routine or use the bowl to produce giveaway items or anything else you want. Home Brew - This is Andrew's almost impromptu method for making a hot cup of coffee appear. It makes a great ice break or fun effect to do at the coffee house. Freefall is an easy to perform effect that's almost impromptu in its simplicity. You can use it onstage with a bowling ball or up close with a brick you can leave as a souvenir. It's got multiple applications including one that's right for your show.